This is the second episode in our QT-ESL series. 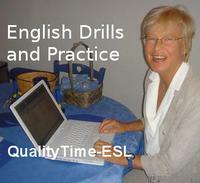 QualityTime-ESL podcasts are very easy to begin with but rapidly become much more challenging. The script and worksheet are provided in PDF. Just click on the icon to download the recording, worksheet or the script. I hope you enjoy this first episode.